Andrea Lucado and I connected a few years ago in Nashville, after Rachel Cruze (Dave Ramsey‘s daughter) gave me the idea of connecting with other “daughters.” If you don’t know who Andrea’s father is, he’s written a few books (and by “few” I mean, like, 100). What connected us was our author-pops*, but what solidified our meeting was smoked sausage. Yeah, if you don’t live in the south or Nashville, in particular, you might have the same reaction that I did. But I trusted Miss Lucado, and I don’t regret it one bit. Oh, and the point of all this? Andrea writes a bit, too, and I asked if I could share her thoughts with y’all. I suggest reading while consuming some food item that has the words “smoked,” “sweet,” or “mama’s” in the title. *Wrote that and realized it sounded like Otter Pops. Now I want one. Is Love a Feeling? Balancing Butterflies. This lightbulb moment, like many in my life, began in my car. I sat parked in front of my first apartment in Nashville talking on the phone with a boy I had been dating long distance off and on for several months. We were having another difficult “Should we be dating?” conversation in which I was the flustered girl and he was the confident man trying to reason with me. Finally he asked me a question I did not want to answer, not for myself and certainly not for him: “Do you get butterflies when you’re around me?” I paused. The answer, I knew and had known all along, was no, but I absolutely could not tell him that. I also absolutely could not continue the way we were, knowing I didn’t feel the feelings for him I thought I should feel. I felt relieved. I had finally come out with it—what my hold-up had been in the relationship. He got butterflies around me, but I did not. With those words we would officially be over. WHAT? You don’t? (Why not?) Then why do you still want to be together? My heart does not rapidly beat each time you hold my hand, and neither does yours. Clearly, this is not going to work. He then began speaking about something I did not understand: the idea that relationships are not only about feelings. And with his calm explanation, the light bulb started to flicker. If you were my friend in college and you started dating someone, you would get drilled by me about your feelings. “Do you really like him? Like, like him like him? Does he give you butterflies?” If you hesitated in your answer to any of those questions, I would encourage you to write the guy off. Nope, you don’t like him. Move on. You need passion and feelings and fireworks. If any of those things were missing, you were wrong—and yes, I meant wrong—in dating that person. Where did I get this idea from? The usual suspects, I suppose: romantic comedies, Seventeen, Disney, my overactive imagination. Where did I not get the idea from? The Bible, where all ideas for someone of my faith should originate. Yet, I had somehow managed to disregard biblical truth when it came to relationships with potential life partners. Did you know Jesus never talks about butterflies? Nor does Paul or any of the gospels. In my misunderstanding of what was important in relationships, I was misunderstanding love and what it really is. The passage you always hear at weddings lays it out very clearly, “Love is patient, love is kind. It does not envy, it does not boast, it is not proud. It does not dishonor others, it is not self-seeking” (1 Cor. 13:4-7). It is not self-seeking. Hmm. I had completely ignored that verse and created a dating philosophy that matched my wants. It was not until that moment in the car on the phone that I began to understand I may have been missing God’s intention for marriage and may have been very selfish in my relationships to that point, writing off godly men who did not give me the feelings I thought I needed to sustain in a relationship. Of course there must be balance. So I now find myself navigating the waters of not being too reliant on feelings but not completely oblivious to them either. 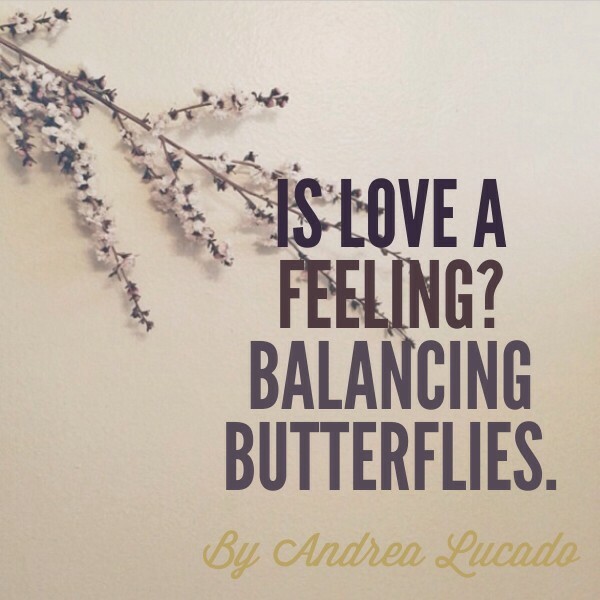 It is tricky business, but I believe that balance will strike one day, and I am so relieved I don’t have to depend on my ever-changing feelings and tummy flutterings to know when it has. Epilogue: The guy on the phone and I didn’t work out in the end, but I am forever grateful for that lesson he taught me and the way he illuminated my skewed thoughts on why two people should do life together. Andrea Lucado is a book publicist by day and freelance writer by night. She has lived in Nashville, Tennessee, for three years but calls Texas home. She is happiest with a Starbucks in her hand and laughing with good friends. When she is not writing or trying to convince the media to talk about authors and their books, you can find her running the hills of Nashville or creating nearly edible baking creations in her kitchen. Someday she’ll get the recipe right. Check out Andrea’s website HERE. Follow Andrea on Twitter HERE. This is wonderfully worded. As a visual creature, I can get the “butterflies” when I see any beautiful woman. However, love and relationships are about so much more. Love is a feeling of affection. The butterflies are just a weird chemical reaction to another person. Love and relationship actively takes work and can be challenging. A relationship brings together two people that have different lives, (similar but usually different) standards, and thought processes and trying to make them compatible. However, as was brought up in the Tuesdays with Normie post, just because it’s hard doesn’t make it bad. I really appreciated this article! What a great reminder to evaluate all aspects of a relationship and not just our feelings. But I have to admit, the real reason I am commenting is because I got really excited when you linked to this on Twitter about being “twitterpated”. I thought I was the only person who used that term in real life. Yay!